What does Ancestors Legacy add to the base game? For each of the three Plots, you will discover different and customizable game set-ups. The biggest challenge of this edition will be comprised of two specific plots which will take the game to an entirely different level. Plots are something completely new for 12 Realms. A Plot may have you playing with six Realms (combining old and new lands), facing all of the Dark Lords, or creating a really fast game with a unique set-up. In each Plot there is a different winning condition, some different rules and mechanics. The basic mechanics of the game do not change, we just add few variations to the setup to make the game more challenging plus we make some suggestions with how many players and variants you can play with each Plot. 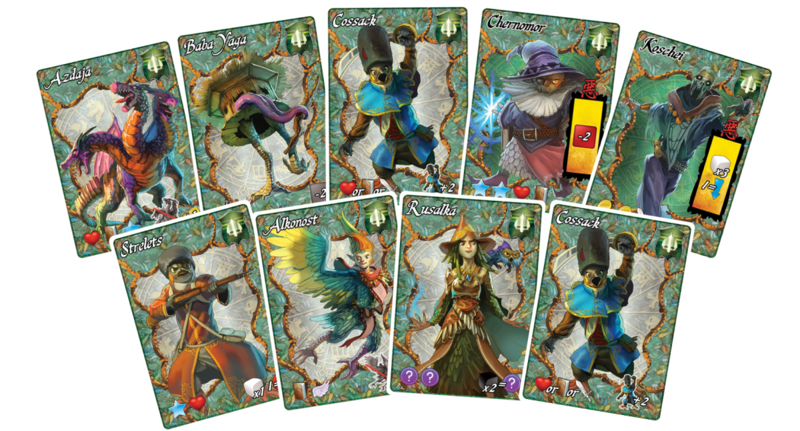 We have prepared 8 and we hope the 5 of them be unlocked as stretch goals through our Kickstarter campaign. How did you go about designing these new plots? Are they purely based on game mechanics or are they thematically built around the fairy tale characters? Well we thought to make something new for the game and we had a ton of mechanics and ideas, so we said we will make Plots! Story and Scenario, let’s make the game more challenging. 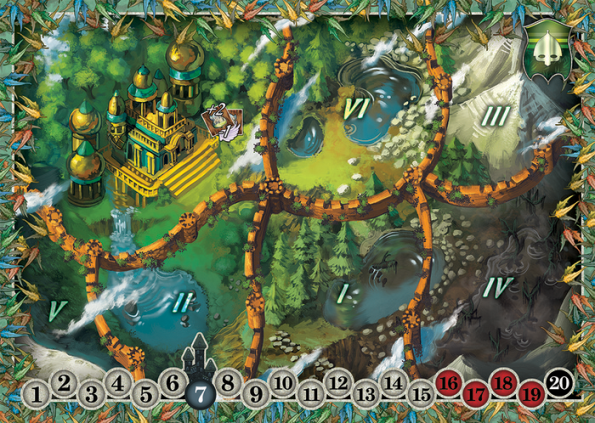 3 Plots are included in the game. Each Plot is corresponded to a different Realm and at the same time you combine it with other Realms through our suggested set-ups. Each Plots is based on the theme of a Realm plus brings a new mechanic by altering the winning conditions and changing several rules. For example: The Double Challenge corresponds to Kievan Empire and the Broom Hunt corresponds to Silver Kingdom and so on.. The original 12 Realms had some design issues such as complex iconography and character selection having a major impact on difficulty, what have you done to address these issues in the expansion? In this campaign we will not only publish the next edition of 12 Realms but also reprint the basic game with some changes and improvements: The unpainted minis will be glued to their bases and a little harder, we have created a Reference Sheet recommending how to combine the game with the Variants and the rules have been enriched with a detailed FAQ which covers some issues and details each card. Those who have the basic game and support Ancestors Legacy will get the reprint kit of the first edition for free (cards and rulebook). Ancestors Legacy has another rulebook, its own rules and stories. Ancestor’s Legacy brings us up to 8 realms to play with, so can we expect another expansion next year to take us up to the titular 12 Realms? If people really love it and support it yes we will have the final edition of the game, the last 4 realms… or I should 5! There will be a secret realm. We can announce more after this campaign ends and see how many people support the project. Beside do not forget that we do everything for the gamers. What influences did you draw on for these new Realms? No, influences. The designer of the game sent us descriptions of each character and then with our artists we saw the theme of each Realm and we starting designing the heroes etc. based on all the info and at the same time we tried to keep the same art level as in the first edition but with a level up regarding the game’s development. Do the new realms play the same as the those in the original game or can we expect some surprises? Each plot is different, TOTALLY! We will blow your mind how much different each one is. Of course some basic elements remain, like you have to face the Invaders. A Plots which is exclusive only for Kickstarter and Spieleschmiede Campaign is Ghost Galleon. The Ghost Galleon floats around Bones island and curses each area it passes over. One Hero must get on board, destroy the undead pirate and take control of the Galleon, but then he is cursed and cannot abandon the ship and the ship is the only means to destroy the target, the Active Fortresses. So get ready!!!! 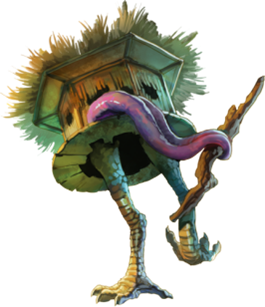 Finally, what’s with the crazy hut on chicken legs?! Ha, ha chicken in Action! Well, welcome to the Kievan Empire, its mythology and the myth of Babayaga! Many thanks to Alexander Argyropoulos for taking the time out to answer my questions. Ancestors Legacy is currently on Kickstarter and has already reached its funding goal!